Vanshlochan (also known as Tabasheer, Bamboo Silica, & Bamboo Manna and spelled as Banslochan & Tabashir) is siliceous resin and bamboo exudate, which is a form of herbal silica obtained from female bamboo trees. Vanshlochan secretes from nodes of bamboo trees. It is collected from the female bamboo tree’s nodes for therapeutic uses, as used in Ayurvedic Medicine and Unani Medicine. In Astanga Sangraha, Banshlochan and Tabashir are described as different remedies and description of both remedy is in same place. Nowadays, Tabasheer is taken as alternative of Vanshlochan. Tabasheer is also less available and now adulteration becomes another problem for getting the original Vanshlochan. Artificially prepared Vanshlochan is now sold in Indian Market, which results in a huge loss of ayurvedic physicians and lovers. The Artificial Vanshlochan is prepared from Sodium Silicate and Ammonium Silicate. These both chemicals are mixed in water. Then the mixture is leaved for drying. After drying process, the material obtained is sold as Vanshlochan. Vanshlochan is a good source of natural Bamboo silica. Bamboo silica (FOLIUMBAMBUSEA) contains more Silicon dioxide as compared to other silica plant sources. It contains about 70 to 90% silica content. Note: Nowadays, This Vanshlochan is not available. Vanshlochan available in the market with the name of original Vanshlochan is actually prepared by burning bamboo stems. It contains bamboo stem ash and a little amount of the real Vanshlochan. Nowadays, it is used in ayurvedic medicines. The amount of silica content in this type of Vanshlochan varies from 0.50% to 3%. However, the chemical composition is different, but Vanshlochan and Tabasheer both are beneficial in same diseases except lung disorders. In lung diseases, Vanshlochan gives best and promising results. 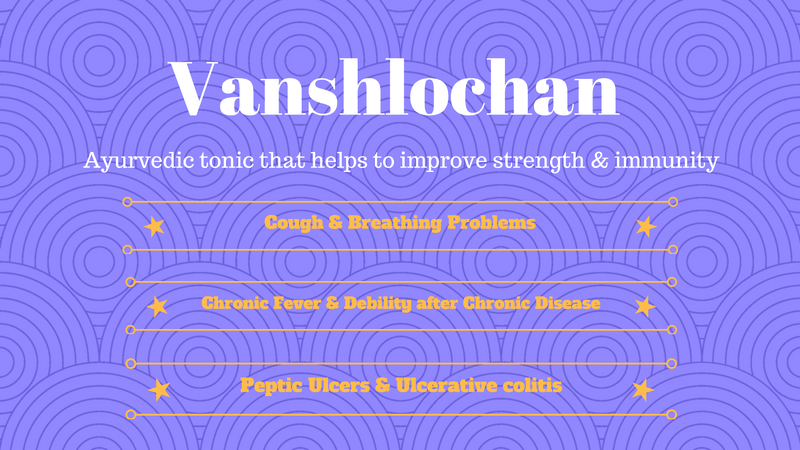 Vanshlochan has following healing properties. Vanshlochan is helpful in following health conditions. Vanshlochan is beneficial because of its strengthening action and adaptogenic properties. The main content of Vanshlochan is silica (Silicon dioxide), which is an important element for bones, ligaments, tendons and skin. Vanshlochan has restorative effect on body tissues. According to ayurveda, it increases immunity, so it is a main ingredient of Sitopaladi Churna used as immuno-modulator. It is a very effective medicine for cold and running nose. Vanshlochan has ulcer healing properties. Along with Praval Pishti, Mukta Pishti, and Yashad Bhasma, it gives excellent results in peptic ulcers and inflammatory bowel diseases such as ulcerative colitis and Crohn’s disease. The following Vanshlochan combination is useful for the treatment of ulcers and ulcerative colitis. The combination can be taken twice daily with water. Vanshlochan also stimulates hair growth and strengthen hair. This effect is due to natural silica content in it. The silica in it prevents hair thinning and hair loss. The recommended dosage of Vanshlochan is as follows. We have included the safest and most appropriate dosage in the above table, which has not shown any unwanted effects in people, we had given. The high dosage is possible whenever required according to health condition. For example, 500 mg Vanshlochan does not give promising results in ulcerative colitis, so the high dosage (about 1000 mg twice daily) is required. The original Vanshlochan (bamboo exudate) is POSSIBLY SAFE & WELL TOLERATED. Tabasheer (starch from Curcuma Angustifolia) is also POSSIBLY SAFE & WELL TOLERATED. There may be many unknown adverse effects of duplicate Vanshlochan (artificially prepared Banshlochan). If you have observed any, please report us and contribute to this useful publication. According to ayurveda, high doses of Vanshlochan are not good for prostate gland and lungs. In case Vanshlochan is taken in higher dosage, the following things should be used as Antidote according to symptoms and effects. I need to buy Vanshlochan for my research work. Can you please tell me where I should found that please do contact its urgent. We cannot help you for getting original Vanshlochan for your research work. If you need original Vanshlochan, then you should personally collect it from the Bamboo plants. Only then you can be sure for the original. You can do research work on the different types of Vanshlochan available in the market and their effects on the health. The original Vanshlochan is not available in the market. We use the residues obtained after burning bamboo stems. It contains Bamboo Stem Ash and a little amount of the real Vanshlochan. Please read Adulteration in the article above. Thank you so much for your reply Sir its been really helpful for me to see after it. Actually Sir I found some kind of solid material in near by market he was saying that its a part of bamboo and saying its Vanshlochan I m not sure that what ever he says its right or not. Dr. Jagdev Singh Sir can I get your email Id I need to ask you some questions related topic. You can email me questions at ayurtimes@live.com. Vanslochan present in market is of two types first one is soft solid and the other one is hard solid .Can you tell me which one is good?